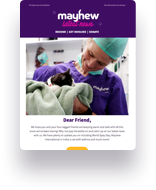 Meet our Mayhew volunteers from reception, cattery and kennels. They help us care for our animals every day. We have over 300 volunteers who help keep Mayhew running every day. The volunteer roles are often challenging but also very rewarding. All the dogs and cats that we take care of have individual personalities and our volunteers help us to make sure they are cared for in the right way. Joan volunteers as a receptionist on a Monday and has kindly been donating her time to us for decades. Jody is a Media Consultant and has been volunteering weekly at Mayhew for six months. Hayley volunteers with our kennels team and was previously a student with us.